Just the item for discouraging armored vehicles from going through your church walls. RPGs are more portable but lack stand-off range. TOW and similar guided missiles harder to come by. This entry was posted in rifle, self-defense, weapon and tagged anti-tank, cannon, WW2. Bookmark the permalink. Looks like about a 30mm , give or take. How serious is the ammo supply? The 57mm one is better. Could work on Patton tanks with APCR ammo. Anyway, homemade Panzerfausts would make more sense. It’s a simple weapon to manufacture, you just need blackpowder, detonators, plastic explosive and metal forming facilites. Looks a bit like the US M5, a 76mm gun from WW2. But…the barrel seems awfully skinny. It’s not a German PAK. Most likely it’s the US M3 37mm fielded early in WW2. It does look like an M3 (37mm ) from WW2. 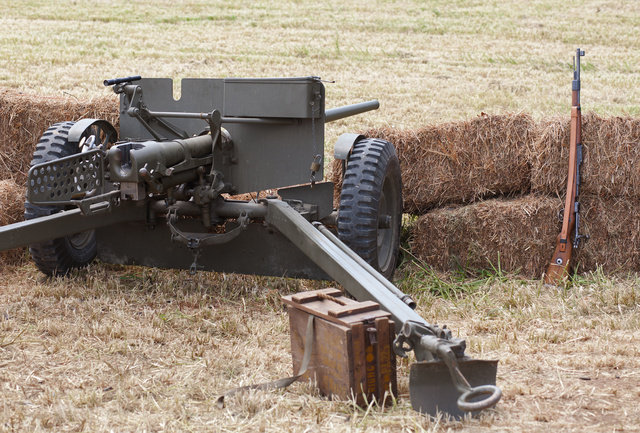 This was the same gun that was mounted on the M5 Stuart tank. While they worked in the Pacific, they were not very effective in Europe. You might as well have been throwing rocks if you went up against a Tiger tank with that. Still it will work just fine against most thin skinned armored vehicles like an APC. WW II Vintage American 37MM. It was obsolete THEN. There isn’t a modern tank that wouldn’t shrug a shot from this off. Police use these crappy M113 in the US, I think. Would go right through one. R: A .50BMG would go through a M113. Christ. And US put soldiers in these tin cans? Israelis used these pretty effectively I think. Mobility solves the smoke issue.. In Steel Panthers 2, one of the most cost.effective anti tank weps. By the Mauser carbine standing near I assume it is a German AT gun. Maybe a Gorlick squeeze bore? I would like to see more of these. 37mm door knockers excepted. Maybe a Russian 57mm high velocity?